Always like hearing about your bike projects. Have any photos handy? I'll take some when I get home. The hardest part was cleaning up the shavings that were everywhere without getting any splinters in my fingers. Luckily rags are cheap. That would be useful, but I'd still have to get the splinters off somehow. My next purchase is going to be a rat tail file to make sure the holes are burr-free. just had a dropper post installed. i'm pretty anxious to try it out (if only we could finally avoid a frost and the trails would dry out around here). 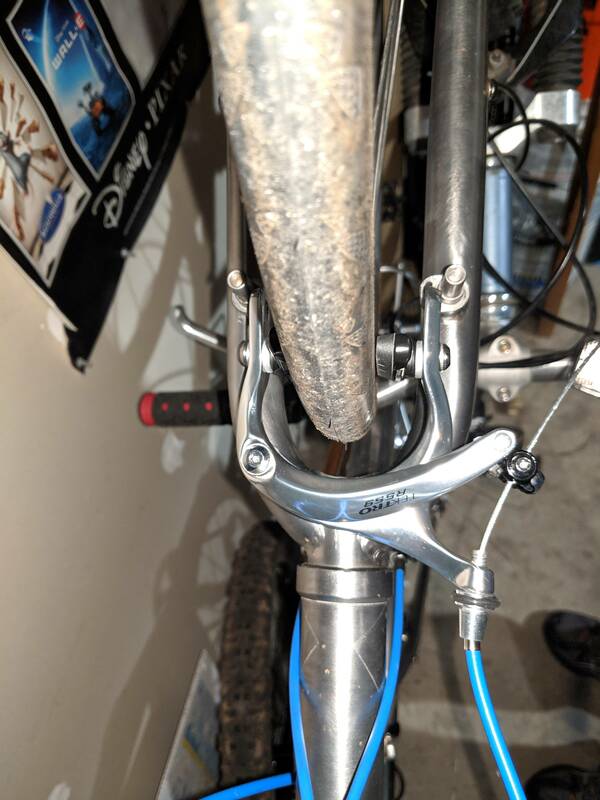 two of the bottle cage rivnuts installed. new brakes installed - you can see the posts for the old ones still. rear brake hole. still have some drilling to do to make the hole bigger. Popped a tire 20 km from home yesterday. $500+ worth of work being done on my bike. New casket in rear, new chain rings up front, new chain, new rear rim, new rear rotor and break pads. Every two to three years the tune-up gets expensive. I would say that your LBS is taking you for a ride (lolz) if that's what they're charging. What kind of bike do you have and what kind of riding do you do? Bune, those cage rivets might inspire me to do the same to my restored Schwinn. It's a heavy duty commuter bike. All prices Canadian and heavily taxed. Free healthcare does not pay for itself. Stopped listening at that point for rear rotor and metallic pads. I definitely pay a parts premium to go a little lighter and heavier duty than stock parts. I ride year round and it is my work commute. I should get about 12k miles (or three years) out of this upkeep. Over that time I should only need to replace brake pads, tubes and tires. After having a hell of a time finding what they were called + finding them to order and then paying too much for them, I accidentally found some in the local Ace Hardware while looking for a screw. So start there first. They're called rivnuts, btw. Also be sure to ask your LBS if they have the tool handy: It's an expensive thing to buy for just a couple nuts. Ah, Canadian. but wtf is a casket? Because I picture something that Kiss would sell you when you call it that. Pics of the brakes installed. 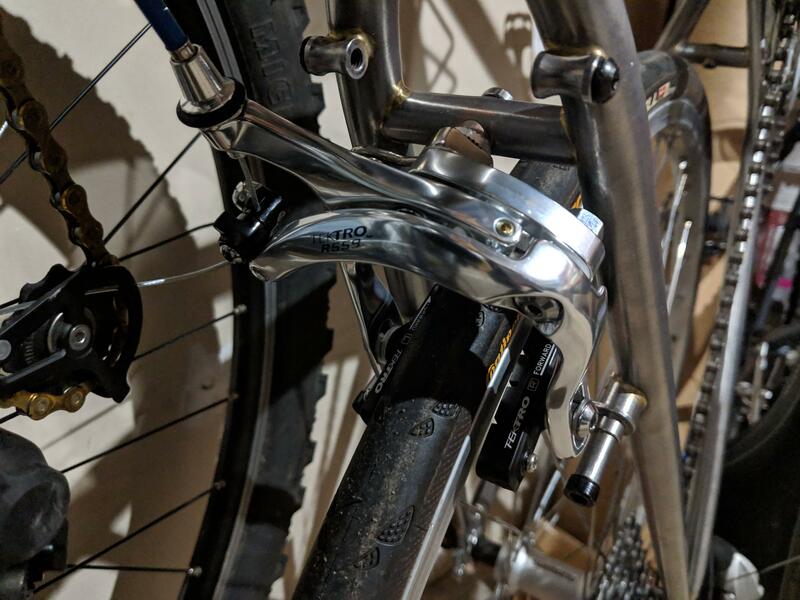 I'm not happy with the install - namely the other brake posts are kind of in the way - but it's the best I can do without hacking them off. 75.60 km on the bike today not including what was probably about a km rip home after eating at the end. I had a pair of ortlieb city panniers come in today but I hated them and returned them. I think I will get the classics. That's a pretty good ride. I max out at about 90km and can still call my bike my friend. What did it take you, 3-1/2 hrs?